All-Inclusive Resorts are a huge draw to the Caribbean region. The concept of paying one price for all of your meals, drinks and activities is attractive to travelers who don’t want to worry about such charges once on vacation. This concept has been available on upscale, luxury cruise lines such as Regent Seven Seas and Crystal for years, however purchasing one of those cruise vacations can be out of reach for some. 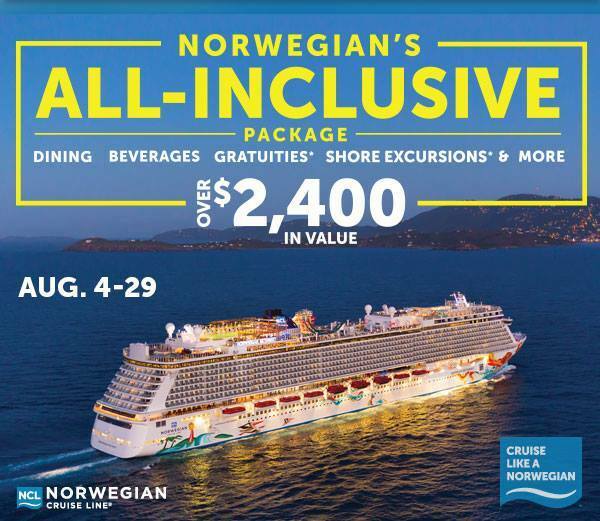 Today, Norwegian Cruise Line has announced that, for a limited time, they will bring the All-Inclusive Experience to the mass market. This is a first for any major cruise line in its category, and I certainly expect the other lines (Royal Caribbean, Carnival, Disney) to follow suit! “The All-Inclusive package is available for 2015 sailings from three to 14 days in length, is priced by the number of days, and is available for all stateroom categories, including The Haven by Norwegian. The Ultimate Beverage package includes a variety of spirits, cocktails, draft beer, bottled beer and glasses of wine up to $10 and unlimited fountain soda and juices at all bars, lounges, restaurants and on Norwegian’s private island, Great Stirrup Cay. Book your 2015 cruise between August 4-24 and your sailing will be eligible for this package! Next Next post: Sandals St. Lucia…coming soon!